Even after a year of BBQ outings, there are still plenty of BBQ joints in the Austin area we haven’t hit up yet. Mann’s Smokehouse, one of only two Austin restaurants to make Texas Monthly’s Top 50 list in June 2008, was one of them, until 10 of us manned up on it for a rainy Saturday lunch. Time to mail some stuff! 1. My Man-Up stamps are in! 4. Russell, Megan, Joel et al. 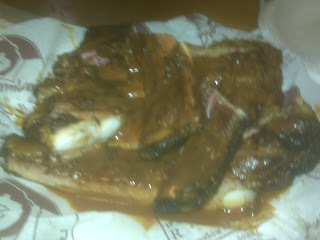 hit up Baker's Ribs in Dallas and Randy White's in Frisco. 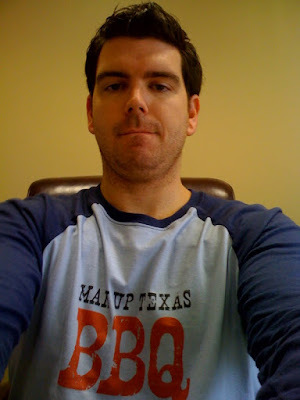 Man Up makes its first trip to Bert's BBQ in Austin. Stay tuned for review and pics. My final stop of the day in Boerne was Fritze's BBQ & Catering, on the north end of Main Street. Fritze's was opened in December 2007 by David Fritze, with whom I had the pleasure of spending the better part of my visit. Housed in a former furniture store, Fritze's is decked out in comfortable Texas decor, with seating available in the main dining area, the front and back patios, and the beer garden (in which the host live music from time to time). Unlike most Texas BBQ joints, Fritze's uses an indoor rotisserie to cook their meats. They have one smoker out back, but it's not used unless the rotisserie is on the fritz (pun intended). Fritze's does a large catering and drive-thru business, and they always strive to be family friendly. They have daily specials, even do BBQ baked potatoes, and, according to David, "will never fry anything." David told me the next menu endeavor will be breakfast tacos. As this was my third lunch of the day, my appetite wasn't huge, so I sampled the brisket, pulled pork, sauce, and green beans. The brisket was similar to the brisket I had earlier in the day at Bar D BBQ: thinly sliced and smokey; the pulled pork was thin and stringy, with a mix of inside and outside cuts; the green beans (my first side of the day) were served hot, but that's all I remember about them (The vegetables at Fritze's come with unlimited free refills. 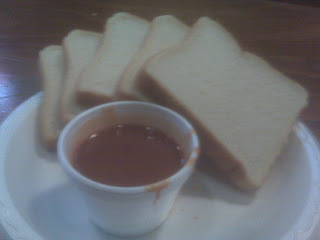 ); and the sauce was great: thin, peppery, tangy, and piping hot. David sent me home with a half chicken, which I reheated in my oven and downed that night for dinner (very good). Next time I'm there, the main event will be the half chicken with sauce. David, Katie, and everyone at Fritze's were wonderful hosts, and it seems like they've got a good thing going at 926 North Main Street in Boerne. It was easy to see that David, who's spent his entire career in various positions in the food/beverage industry, truly loves what he does. Stop in to see him, next time you're in Boerne, and stay tuned for more pics. In light of the fact that we actually sold one of these last week, today's Merchandise Spotlight is the Doggie Ribbed Tank Top. It's 100% cotton, folks, and comes in 6 colors and 7 sizes, so you really have no excuse denying your canine this simple pleasure, especially as colder weather moves in. And, while you're at it, might as well get some other stuff. After my first lunch at Bar D BBQ, I continued on down Main Street and stopped for a second lunch at Riverside Market, in the center of town (491 South Main St.). Akin to Rudy's, Riverside is inside a gas station/convenience store. Riverside is no-frills. Not a place for big groups or a place to soak up the atmosphere, but it's a great place to stop in for a quick lunch. I wanted to still have some room left for my third stop, so I simply ordered a slice of brisket and a slice of pork loin ($1.08, including tax). The thick slices were pretty dry. If I return, I'll probably give the half chicken a try. Not an official Man-Up outing, since we weren't in Texas, but Brad and I hit up Dreamland BBQ in Northport, Alabama, after going to the Alabama-North Texas game in Tuscaloosa. 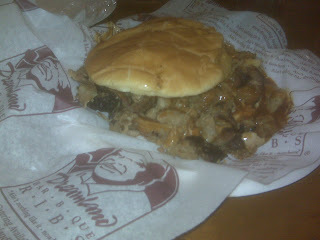 Half a rack of Dreamland's famous ribs and a big pork sandwich, sopping in sauce on a bun with a liberal amount of butter. In other words, really healthy. Didn't have my camera, so we'll just have to settle for pics from my Blackberry. Another option would've been to hit up Archibald's (amount a mile from Dreamland), whose ribs, I think, are the best I've had in Alabama. Next time. Best. Casual. Friday. Outfit. Ever. Just when you think Bo can't get any more awesome, he goes and pulls a stunt like this!!! 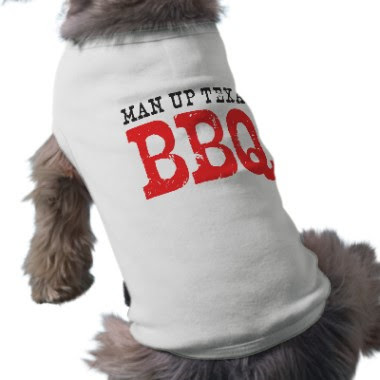 $3 off all Man-Up t-shirts!!! QOTD: Is a smoker a necessity for true Texas BBQ? Man Up added to blogroll of Relish Austin! Man-Up Keds?!?! Shut the front door!